Have you or a loved one suffered serious burns at work, in a car accident or under other circumstances where another party may have contributed to your injury? Call burn injury attorney Bart Bernard for a free case review. His knowledge of fair burn injury settlements will help guide you and your family to receiving just compensation. If the defendant attempts to low-ball you, Bart Bernard is prepared to go all the way to court in pursuit of a higher award and justice served. Burns are devastating, life-long injuries. Money can never remove all of the heartache, but it can help you face another day and take another step toward healing, without financial worries on top of it all. A burn injury lawsuit also holds people and companies accountable for their actions, so similar injuries do not happen to others. About 486,000 people seek treatment from U.S. burn centers each year, according to the latest numbers provided by the American Burn Association. One civilian fire death occurs every 2 hours and 41 minutes, with 3,275 annual burn and smoke inhalation casualties. The CDC lists burns as one of leading causes of accidental death. Eighty percent of burn injuries and deaths are preventable, says the Burn Institute, so it’s worth investigating whether the carelessness or ineptitude of another person contributed to the burns you or a loved one sustained. In addition to getting your burns documented by a medical professional, burn injury lawyers usually have their own team of medical experts who are familiar with the courts and with providing compelling testimony that can sway a judge and jury. That is all part of the value in seeking legal counsel. Once your condition is stabilized, it’s a good idea to call a burn injury lawyer right away to start exploring your options, since the State of Louisiana has a short one-year statute of limitations on filing medical malpractice, product liability, and personal injury lawsuits. Should you file a burn injury lawsuit for a workplace accident? The burn can be traced back to a defective product or malfunctioning piece of equipment. The negligent or reckless activity of a manager, engineer, subcontractor, vendor, maintenance personnel, inspector, or coworker contributed to a dangerous situation that led to the accidental burns. The medical bills and economic damages exceed the typical worker’s comp payout of $40,000. Burn injury lawyers can build a substantial case for negligence by establishing duty, breach of duty, causation, and damages. The plaintiff’s proof comes by way of physical evidence, witness testimony, and corroborating testimony from experts like doctors, accident reconstructionists, engineers, code inspectors, firefighters, and others. How much are burn injury settlements worth? $1 Million – when a hospital patient’s bed caught fire due to faulty product design. Severity & Losses: Some people wonder if first degree burn settlements pay out much, as these burns are considered relatively “minor” or “superficial.” Plaintiffs can still recover large sums if the burns cover a large percentage of their bodies (>10%), if they were unable to work as a result of the injuries, if the recovery was long, if the burns were intentional, or if psychological damages can be proven. Pre-existing Conditions: Defendants may try to reduce the amount of money owed by arguing that the plaintiff had pre-existing conditions that caused some of their physical pain and suffering. Pain & Suffering: In addition to receiving compensation for tangible losses like medical bills or lost wages, burn victims often receive money for the mental burden burn injuries place upon them. Burns lend themselves to a high level of emotional pain and suffering due to the likelihood of permanent scarring and disfigurement. Pain and suffering may be calculated by multiplying the actual damages by 1-5, depending on the severity of the injuries. The courts have upheld pain and suffering verdicts ranging from $300,000 to $3.6 million. Punitive Damages: Punitive damages are designed to punish the wrongdoer when the economic damages are not enough to affect a wealthy defendant. Your Fault: Louisiana uses a “Pure Comparative Fault” system, where the plaintiff can recover damages regardless of their fault – although the amount of compensation collected may be reduced. For instance, if a burn victim receives a burn injury settlement of $750,000, but it is determined he was 40% at fault for the accident, he may only recover $450,000. Due to the way the law is written, hiring an aggressive attorney with a track record of big wins is especially important to a burn injury lawsuit. 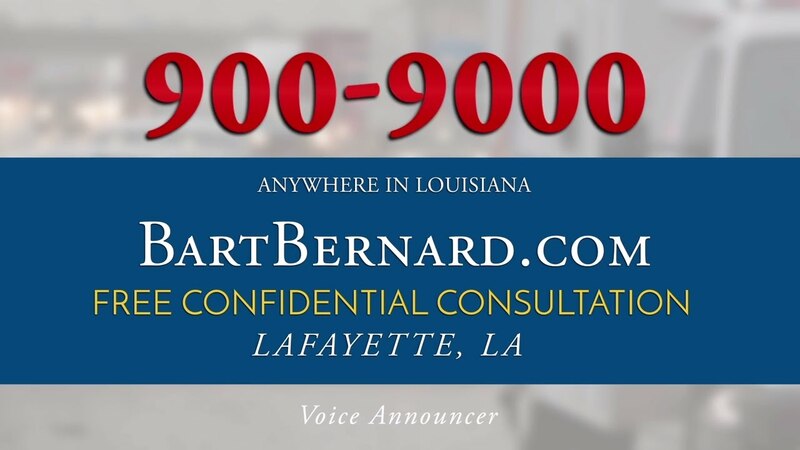 Bart Bernard is a leading personal injury and burn lawyer in Lafayette and Baton Rouge, Louisiana. He has a compassionate heart for burn victims and fights for top-dollar settlements. He has earned membership among the Elite Trial Lawyers of America and the Multi-Million-Dollar Advocates Forum. Call Bart Bernard for a free, no-obligation case review and pay no legal fees unless your case results in a win!